Serialized storytelling can make our experience with tv shows pretty consistent. If I approach a new episode of The Leftovers I know, as a fan of the show, that it’s going to be sixty minutes of perfect, dark, heartbreaking writing about the human condition and in the same way I’d expect nothing but silly, funny entertainment from New Girl. GBBO is different. At the beginning of each episode I see some middle-age woman going through the technical challenge as if she was on a space mission to save the earth from its collision with an asteroid and I joyfully roll my eyes at her. I gaze at her frightened look when she’s about to open the oven and remind her vocally that she’s baking biscotti and not a cure to AIDS. 20 minutes later, of course, I’m lying on my couch in fetal position, crying my eyes out because someone’s scones turned out underbaked and I’d give everything I have to fix their mistake. GBBO is a weird, emotional roller coaster, the kryptonite to my sarcasm and it’s like I never learn my lesson. Dear Queen Elizabeth, you’re lucky that England is into aristocracies and not meritocracies otherwise you’d be in trouble. 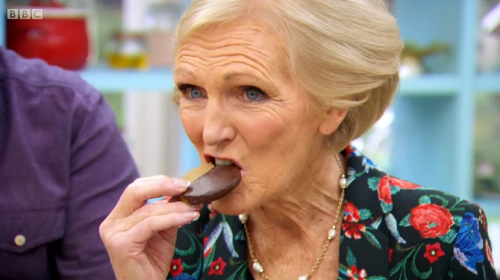 Because seriously, isn’t Mary Berry the most extraordinary woman who’s ever lived? She’s had an incredible life and at age 80 she keeps delighting our existences with an outstanding fashion sense, sacred recipe books and the loveliest personality. Also, the lady created her OWN BRAND OF SALAD DRESSING. In case you don’t know her, let yourself be moved by the beautiful poetry of this YouTube video. Food used to be the one thing I wasn’t demanding about. I could have spent hours destroying your favourite bands and then show enthusiasm towards absolutely anything you’d cooked; dead or alive; healthy or unhealthy; frozen or fresh. But then cooking shows started existing and made us all suddenly food critics. If my boyfriend decides to make pancakes for breakfast I won’t devour three in a row, jump up and down like a teletubby and tell him how amazing they were. Not anymore. I will instead cut a microscopic portion out of them, chew it with a focused, professional look and say: “They are goood….but you won’t be star baker this week”. I’ll be opinionated. I’ll throw judgmental looks at my friends’ pies’ soggy bottoms. I’ll voice disappointment every time a cake has less than 13 layers and is not shaped like a windmill/monument. Most of all, I will limit myself in ways that I had never done before. You guys, my boyfriend is mad at me ’cause I’m refusing to eat something that expired in May 2015. 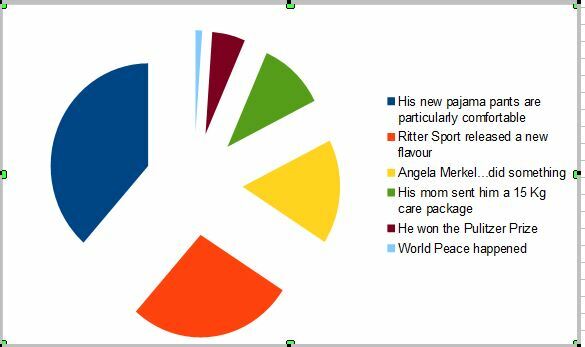 Discuss. In the latest edition of the show there was one contestant – namely Tamal Ray – who was clearly perfect in any imaginable way. 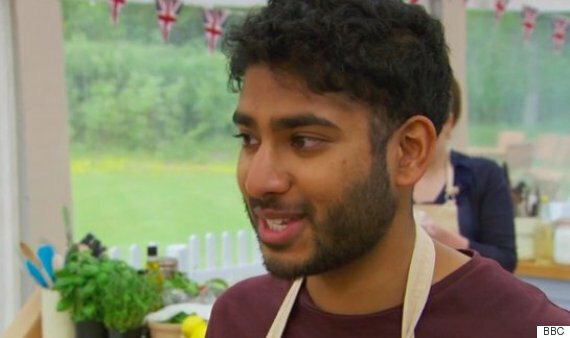 Cute, doctor, amazing baker, sensitive and humorous, Tamal won my heart on the very first episode and on the day I found out he’s gay I lost it. The next thing I remember is a British man in a uniform shooting me with a tranquilizer gun and being extradited from the UK forever. Why complimenting people’s culinary successes with words when you can go to them and awkwardly shake their hand? I am a real, true disaster in the kitchen but the Great British Bake Off still made me want to try harder, give my best, experiment and treat cooking like the art that is. Then cry, give up and order sushi on the internet.